At the end of each summer, I generally have a distinctive “z” shaped tan on my feet from wearing Chacos almost every day. I originally got a pair upon the suggestion of a friend on my field crew while working in Olympic National Park and that pair lasted me almost 5 years. They became my best friend as a sandal in which I could walk up fairly large hills and with which I could backpack in the summers. Much like many of my shoes, they also work well around town or while traveling since they look fairly nice as well. Perhaps their biggest claim to fame while in my closet is the hike I took through Denali with them as my sole shoe. The first time I was there I was geared up for tundra with large boots, gaiters, etc. But upon my return (that was the hangout for us while living in Fairbanks), I realized that the warm and sunny summers didn’t require such coverage and the next time I packed fairly light. The Chacos made it up to ridgelines and along river valleys for 5 days of hiking roughly 12 miles a day – and without requiring a shoe change at each frequent river crossing. They were the perfect shoe for the wet and wetter type of habitat. Early on I realized the one downside of the Chacos – sand. In an attempt to hike a 9 mile loop through maritime forest and along the Pacific Coast in just Chacos, I quickly ended up a barefoot hiker, lucky that the trail was largely sand or boardwalk, substrates amenable to my bare soles. The sand worms its way into the fabric of the straps and irritates the skin directly in contact. A pair of socks in between prevents such irritation, but then you have to live with yourself as one who wears socks and sandals together in public. Utility: 3. Since sandy environments play a large role in my life, they’ve taken to spending more time in the closet. But previous to living on the coast, I wore them everywhere until the snow fell. Durability: 4. I’m now on my second pair of some serious wear. 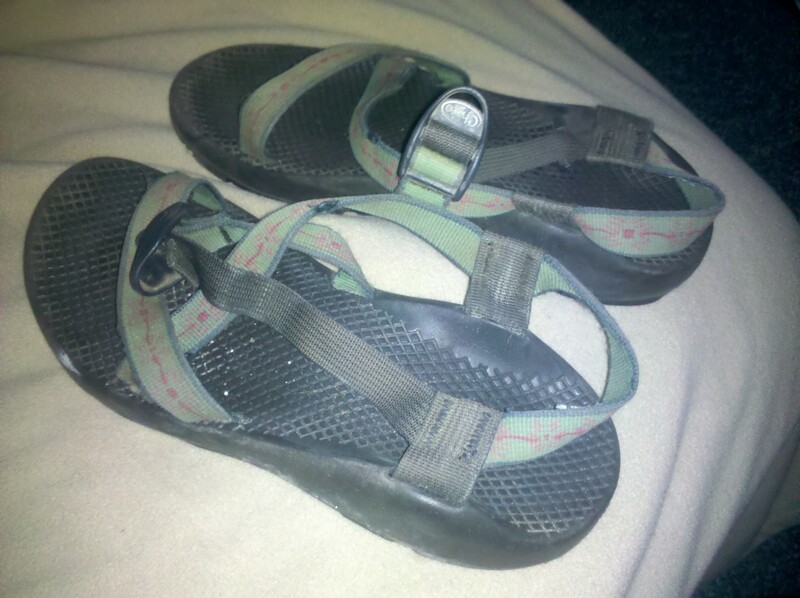 I opted for a new pair, but could have had the first repaired when I wore through the soles – it was standard wear and tear and Chaco will replace soles and straps as needed for a reasonable fee as long as you want to keep the shoes. Comfort: 3.5. They’re fabulous excapt around sand. I’ve never had problems with blisters or break-in at the advent of the warm season. The strap system makes them the single most comfortable sandal I have ever worn. Price: $$$$. At around $100 for the standard pair, they’re on the pricey end as far as shoes go and take a bite out of the average grad student monthly paycheck.